The Earth has many diverse ecosystems and ecosystem diversity. 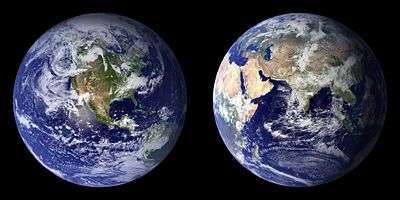 These are NASA composite images of the Earth: 2001 (left), 2002 (right), titled The Blue Marble. Ecological diversity is a type of biodiversity. It is the variation in the ecosystems found in a region or the variation in ecosystems over the whole planet. Ecological diversity includes the variation in both terrestrial and aquatic ecosystems. Ecological diversity can also take into account the variation in the complexity of a biological community, including the number of different niches, the number of trophic levels and other ecological processes. An example of ecological diversity on a global scale would be the variation in ecosystems, such as deserts, forests, grasslands, wetlands and oceans. Ecological diversity is the largest scale of biodiversity, and within each ecosystem, there is a great deal of both species and genetic diversity.